Deepen your sense of the past at sights like Earthquake Lake and The Soldiers Chapel. Step off the beaten path and head to Nature & Wildlife Tours and Mesa Falls. Explore West Yellowstone's surroundings by going to Gardiner (Yellowstone Gifts & Sweets & River Rafting & Tubing), Big Sky (Grizzly Outfitters Ski & Backcountry Sports & Lone Peak) and Island Park (in Eaton Rapids). And it doesn't end there: hike along Jenny Lake Trail, take a peaceful walk through Teton National Forest, contemplate the waterfront views at Yellowstone River, and trot along with a tour on horseback. To see photos, where to stay, traveler tips, and more tourist information, go to the West Yellowstone trip itinerary planning website . Portland to West Yellowstone is an approximately 6-hour flight. You can also do a combination of flight and shuttle; or drive. You'll lose 1 hour traveling from Portland to West Yellowstone due to the time zone difference. While traveling from Portland, expect little chillier days and colder nights in West Yellowstone, ranging from highs of 57°F to lows of 31°F. Finish your sightseeing early on the 3rd (Mon) so you can drive to Yellowstone National Park. You'll explore the less-touristy side of things at Upper Falls of the Yellowstone River and Biscuit Basin. Your inner history buff will appreciate Uncle Tom's Trail and S Rim Trail. Spend the 6th (Thu) exploring nature at Old Faithful Visitor Education Center. 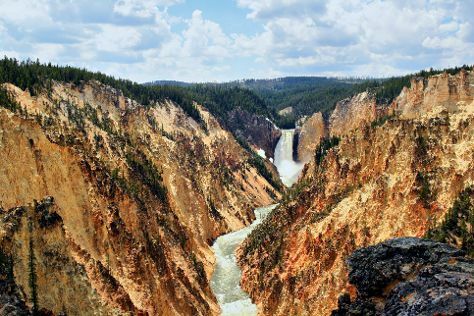 Spend the 9th (Sun) exploring nature at Yellowstone National Park. Next up on the itinerary: witness a stunning natural landmark at Old Faithful, admire the local landmark of Fountain Paint Pot, take in breathtaking views at Grand Canyon of the Yellowstone, and explore the activities along Dragon's Mouth Springs. To see more things to do, reviews, photos, and more tourist information, you can read our Yellowstone National Park vacation planning site . Traveling by car from West Yellowstone to Yellowstone National Park takes 1.5 hours. Alternatively, you can take a bus. June in Yellowstone National Park sees daily highs of 66°F and lows of 34°F at night. Wrap up your sightseeing on the 11th (Tue) to allow time to travel to Keystone. You'll explore and learn at The Museum @ Black Hills Institute and Warrior's Work & Ben West Gallery. Get in touch with nature at Horseback Riding Tours and Mount Rushmore National Memorial. Get out of town with these interesting Keystone side-trips: Custer (Custer State Park, Cathedral Spires Hiking Trail, & more). Pack the 13th (Thu) with family-friendly diversions at Rushmore Tramway Adventures. There's lots more to do: cruise along Needles Highway, view the masterpieces at Insideout, take your sightseeing to a higher altitude at Harney Peak, and go for a walk through Breezy Point Picnic Area. To see traveler tips, reviews, photos, and other tourist information, read our Keystone travel route site . Do a combination of car and flight from Yellowstone National Park to Keystone in 6.5 hours. Alternatively, you can drive; or do a combination of car, bus, and shuttle. In June, Keystone is somewhat warmer than Yellowstone National Park - with highs of 73°F and lows of 48°F. Wrap up your sightseeing on the 17th (Mon) early enough to travel to Grand Rapids. Museum-lovers will get to explore Gilmore Car Museum and Grand Rapids Public Museum. Escape the urban bustle at Stearns Park and Oval Beach. Get out of town with these interesting Grand Rapids side-trips: Little Sable Point Lighthouse (in Mears), J. Petter Galleries (in Douglas) and Ludington State Park (in Ludington). And it doesn't end there: kick back and relax at Silver Lake State Park, tour the pleasant surroundings at Pier Cove Park, examine the collection at Air Zoo, and look for gifts at Horrocks Farm Market. To find maps, traveler tips, ratings, and tourist information, use the Grand Rapids route tool . Fly from Keystone to Grand Rapids in 6.5 hours. Alternatively, you can do a combination of flight and bus; or drive. The time zone difference when traveling from Keystone to Grand Rapids is 2 hours. Expect a bit warmer temperatures when traveling from Keystone in June; daily highs in Grand Rapids reach 79°F and lows reach 59°F. Cap off your sightseeing on the 23rd (Sun) early enough to travel back home.